Once upon a time, there were three little pigs that were going to build a house to be safe from a wolf, who was hanging around destroying houses and eating the pigs that were inside. The three little pigs had different ideas and so each pig built a different house. Fatty was the youngest and most impatient. He wanted to finish his house soon and so he decided to build a house of straw and then he went to play with the other little pigs. Hammy, the middle brother built a house of sticks as it wouldn’t take him much time either, and so when he had finished he could also go out to play. Porky, the oldest brother, decided to build his house of bricks. Even if it was going to take him longer, it was going to be a very strong house and a safe place from the wolf. 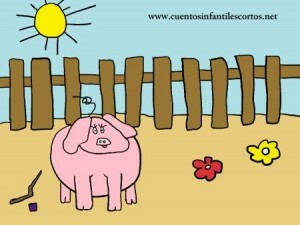 One day the wolf appeared and the three little pigs ran to Fatty´s house made of straw. But the wolf huffed and puffed and blew the house down, so the three little pigs ran to Hammy´s house. The furious wolf followed them to the house of sticks, and huffed and puffed and blew that house down too. So they ran to Porky´s house. The three little pigs were really scared. When the wolf arrived he huffed and puffed but he couldn´t blow down the house of bricks. So he gave up and disappeared, and the three little pigs never saw him again. Once upon a time there were three little pigs and the time came for them to seek their fortunes and build their houses. 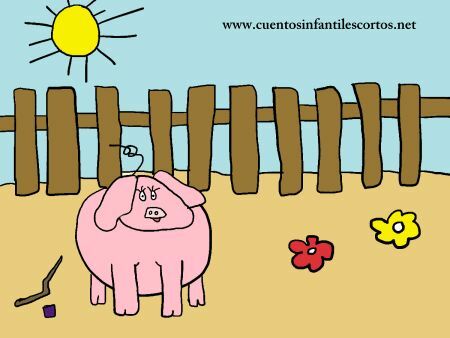 The first little pig built himself a house of straw, the middle brother decided to build a house of sticks, which wasn´t a very strong house either, but the third pig, the oldest, decided to build a house of bricks. He didn’t mind hard work because he wanted a strong house, and he knew that in the woods nearby there was a wolf who liked catch little pigs and eat them. Just as the first little pig reached his door, out of the woods came the big, bad wolf. The little pig squealed with fright and slammed the door. – “Little pig, little pig, let me come in!” – cried the wolf – “Not by the hair on my chinny – chin- chin!” – said the little pig – “Then I’ll huff and I’ll puff and I’ll blow your house in!” – roared the wolf. And he blew the little straw house down. Away raced the little pig to his brother´s house of sticks. The wolf was really angry, so he followed the youngest pig to the house of sticks, where the pigs were singing “Who’s afraid of the big, bad wolf, the big, bad wolf, the big, bad wolf?, – Suddenly the wolf roared – “Open the door, Let me come in!” – ” “No, we won´t!” – said the pigs. “Then I’ll huff and I’ll puff and I’ll blow your house in!” – roared the wolf. And he blew down the little house of sticks. The two little pigs raced away to their big brother´s house made of bricks and started to sing – “Who’s afraid of the big, bad wolf, the big, bad wolf, the big, bad wolf?. This made the big wolf totally furious – “Open the door little pigs!, Let me come in! ” – “No we won’t!” – ‘”Then I’ll huff and I’ll puff and I’ll blow your house down!” – But he couldn´t blow down that little house of bricks. He decided to climb onto the roof and get in through the chimney. So he climbed and jumped down the chimney and fell right into a kettle of boiling water! He sprang straight up the chimney again and raced away into the woods. The three little pigs never saw him again, and spent their time in the strong brick house dancing and singing – “Who’s afraid of the big, bad wolf, the big, bad wolf, the big, bad wolf?, Who’s afraid of the big, bad wolf, tra-la-la-laa!”.